T-Mobile CFO spoke yesterday at an investor conference in Boston, and commented on the recent offer from French telecoms company, Iliad. Braxton Carter exclaimed that the original $15 billion offer was “very inadequate” and that he feels the company is undervalued. As you’ll undoubtedly remember, Iliad came in with a $33 per share offer for 56% percent of T-Mobile US just before Sprint backed out of its long-rumored deal. Speculation was that Deutsche Telekom/T-Mobile rejected the deal immediately, but no executives had spoken openly about this deal, or any other potential merger. However, Iliad did issue an open later stating that they had made an offer, and revealed all the financial implications. Yesterday was the first time a T-Mo exec has spoken on the matter. There’s a chance Iliad could come in with a new, better offer, but it’s hard to imagine how the company can afford it. How about John Legere takes control of the company just look at the turn around but sadly it seems unlikely. That’s probably the best idea I’ve heard this year. DT should just be selling into the open market if they want to rid themselves of TMUS, but they’re too greedy. They want to get the additional premium that comes with selling a controlling interest in a company more than they want to be free from TMUS forever. 1) I don’t fault them for that. Why sell for par value when you can get a premium? 2) Despite leaving money on the table, divesting on the open market isn’t an optimal strategy for T-Mobile going forward. Either a) you get an ownership pool so diluted that there is no management oversight. The current management team is doing a great job, but you still want them to be accountable to someone. Or B) you leave the door open to someone like a Carl Icahn buying up large portions of the shares; directing the company to squeeze every cent out of the stock i.e. a large concentrated investor who is it in for them self and not the good of the company. If DT wants out it is in everyone’s best interest for them to sell a controlling stake in the company to someone who wants it and can steward the company going forward. That would actually depress the price. DT should just take TMO off the market and focus on building the TMO name/brand such that they could kick AT&T to the gutter. Much positive has occurred with TMO in the last 12-18 months. Lots more needs to happen but One could only imagine where TMO would be if DT made a honest effort to take on AT&T in the US as a corporate level initiative. With the next offer “around the corner” mentality at DT it’s sort of amazing that TMO has been able to accomplish what it has in such a short time. DT is the majority shareholder in TMO, not the owner of the company (unlike when it was a private-wholly owned subsidiary). While majority shareholders do have some sway over what happens, TMO takes care of TMO. Shareholders can veto certain actions of a company, but the executive ultimately run the day to day operations-NOT the shareholders. DTs threat of selling has no impact on the day to day actions of the company (except for creating uncertainly in the employee base) unless and until they formally announce a sale/merger and start any proceedings with government agencies. But how would DT selling effect T-Mobile’s ability to offer such great roaming world-wide? ‘Bout time someone over there said both those statements together. I think part of it is DT wants out completely. That was on of the more attractive parts of the Softbank bid that was by-and-large overlooked. If DT wants out of T-mobile offering to buy even less of their stake isn’t really attractive to them. Softbank was willing to buy the entire stake. If DT wants out as rumored, their ideal plan would be to sell their stake at once. Why hold a 5 or 10% minority interest in a company you don’t want to be a part of anymore if you don’t have to? Again the question is if there is actually a company out there still not that Softbank has bailed that can afford to do it. According to most reports, softbank would have ledt DT holding 17% of t-mobile so you are wrong. Because no deal was officially announced, there is nothing to talk about. A stake in a combined Sprint-T-Mobile is vastly different than a minority stake in T-Mobile alone. A stake in a new company that is 2nd in the U.S. by most metrics is different than a stake in a company that is 4th. maybe softbank couldn’t afford it. If published reports are to be believed, the financing was in line for a deal. The regulatory hurdles were not. I wish someone would just put in a proper bid, I for one am tired of hearing about someone wanting to buy T-Mobile. The question is who realistically can right now? Dish? Google, they have thought about entering the carrier game. I’d rather see them have their own true network than be a virtual carrier. They could cry and lobby all they want, but there’s no legal grounds they could do to try to stop it. It is nice, but DT is pretty hands off at this point, so it’s hard to say what things would change. They really want out of the US, so they’re going to keep looking for a buyer. If you believe that, then Iliad’s offer is pretty fair. $15 billion for 56% of the company equates to a value of $26.78 billion for the whole company. Interesting in the article he mentions a company with an extensive WiFi network would be valuable to them. Is he implying tmobile is close to a partnership with one of the major cable telcos? $15 gig is simply an insult for a company especially the previous two offered way more. It is a low offer, but I don’t know that I’d call it an insult. Valuing the company at $33 a share in the offer is a 15% premium over what the stock closed at today. Now typically you will see premiums higher than that in many acquisitions (say 30%), but this isn’t a typical acquisition either. Instead of having to convince many shareholders in a typical inquisition, DT’s opinion is the only one that matters here. Low offer yes, insult? No. At this point what AT&T or Softbank were willing to pay is largely irrelevant as they either know they can’t or believe they can’t pass regulatory approval. at the time of the offer, tmus was at $32 something. it’s a low ball offer especially considering softbank’s offer was about $40 a share (I know, i know, not exactly the same due to what percentage each offer was). Softbank’s offer is no longer on the table though. Was Iliad’s offer low? Certainly in the face of a competing offer at $40/share. That $40/share offer is no longer on the table though.The stock is at about $29 a share, after falling due to the expectation that a merger with Sprint may occur. DT has a price in mind I’m sure that they’re willing to sell at. Whether or not they get that price is what matters now. Why should Iliad (or another company) have to offer more than $15B? T-Mobile is like Big Lots or Dollar General in the mobile industry. You are mistaken, if you think that. T-Mobile is currently valued at around $28 billion dollars b/c of current stock prices and that number will only increase as the company grows larger. T-Mobile is growing the quickest out of the big 4. 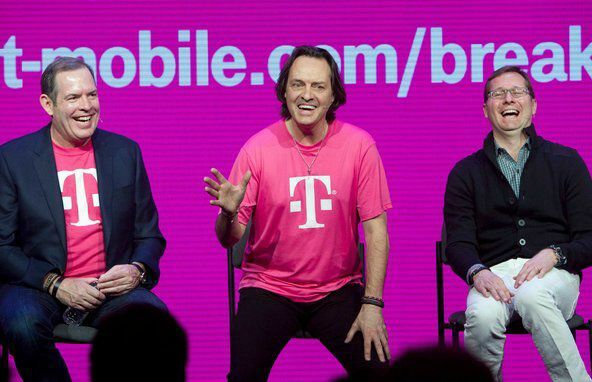 Frankly, I don’t believe illiad can afford T-Mobile with T-Mo’s current value. That said, valuation here is a bit different. Think of selling a house. If I think my house is worth $200,000 and the best offer I get is $170,000, the actual effective market value of my house is $170,000. I like DT can decide the $170,000 is too low and not accept it. This is where market cap can get tricky. And in fact, Iliad is obviously offering a premium on what the market thinks the shares are worth right now. Is T-Mobile worth more than $28.69 a share? Probably. But ultimately if you are selling an asset, the asset’s worth is determined by what someone is willing to pay to purchase it. We’ll see just how much (net) TMO is worth when they have to borrow $5bill for AWS-3 auction and $10bil for 600mhz. The only reason sprint could afford to offer $40/share is because it would’ve benefitted from removing a competitor. I just don’t get it!!! Why are so many people complaining about this new policy? I saw this coming months ago. Obviously this is for customers that abuse the network, I mean there’s people that use over 100GB of data, really!?!?! I thought my average 10Gb were to much. I think its fair what T-Mobile is doing, and yes I use P2P on my mobile rooted device, but don’t abuse it.